Jackie Walejko, graduate student in the University of Florida’s Department of Biochemistry & Molecular Biology, will present on Wednesday, April 6, 2016, from 4:00-5:00pm, in the MSB Building, Room M-304. 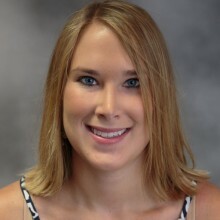 Jacquelyn Walejko is a graduate PhD student in the UF Interdisciplinary Program in Biomedical Sciences. In 2014, Jackie joined the lab of SECIM’s Core 2 Co-Director, Dr. Art Edison, in the Department of Biochemistry & Molecular Biology. She is currently co-mentored by Dr. Edison, now at University of Georgia, and Dr. Maureen Keller-Wood, Associate Dean for Research and Graduate Education and Professor and Chair of Pharmacodynamics. Ms. Walejko’s research involves using proton nuclear magnetic resonance (NMR) to study pregnancy in both sheep and human models. Please post the RPBO seminar flyer for interested parties. For more information, please contact Elizabeth Currin at 352-392-3709 or ecurrin@ufl.edu.